In order to assess the effectiveness of projects intended to increase the participation of members of traditionally underrepresented groups in geoscience careers, short-term indicators of "success" must be identified and developed. Our first step in identifying these indicators was the creation of a model of the science, technology, engineering, and math (STEM) career pipeline, based on a literature review of factors associated with STEM career choice in minority populations. To validate the appropriateness of this model for the geosciences, as well as to identify factors specific to geoscience career choice, we conducted a critical incident study and further refined our pipeline model. We used the model to determine the potential efficacy of different approaches that are being employed by geoscience diversity projects and to show how it can be used for determining the effectiveness of these projects. 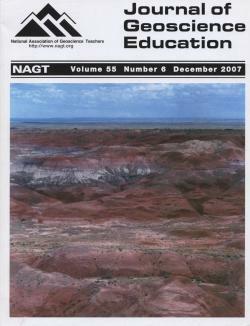 This article studies the effect of an Earth systems Science for All program intervention. This intervention was aimed at cultivating a sense of success and developing cognitive skills among students in classes with a dominant number of students from Ethiopian origin who are characterized by a low scholastic achievement level. The effect the earth systems approach curriculum was studied through a mix of quantitative and qualitative research tools. The battery of qualitative and quantitative research tools that were used in this study, enabled to the collection of data concerning the cognitive and affective outcomes of the implementation of the Earth systems science program. All the different sources of data consistently indicate a very positive influence of the earth systems based science program on the students in both cognitive and emotional domains. These findings were consistently supported by two different sources of information - students and teachers. Native American reservation communities nationwide exercise sovereign control over natural resources and land-use within reservation boundaries. With the recent rapid economic growth of many of these communities, development pressures and infrastructure issues have become a foremost concern. Despite the clear need for geoscience professionals on reservations and the deep cultural connection many American Indian cultures have with the Earth, Native American students remain poorly represented in the earth sciences. The Indigenous Earth Sciences Project is an effort based at Purdue University designed to address this problem systemically by providing local, culturally-responsive avenues for success for college-bound American Indian students in the geosciences in partnership with regional universities. The Sharing the Land program is a partnership between Purdue and colleges and universities in the San Diego region, providing on-reservation education to environmental managers who often lack geoscientific expertise, and a portion of the Young Native Scholars residential summer college bridge program for area high school students. The program also reaches younger children through the Explorers Club outdoor education program. We have also constructed an internship program in tribal environmental offices for Native high school and college students. This far-reaching project provides the minimum level of support to create a truly integrated pathway for Native American students to gain geoscience degrees. Native-focused programs must have full community participation at all levels to succeed, and must provide authentic work experience to make the earth sciences relevant for students. Involvement of Native educators and elders is also critical to ensure cultural connection and continuity. This article outlines the entire STL program, strategies for replication elsewhere, and highlight research opportunities in cross-cultural science education. An effective partnership with Minority Serving Institutions (MSI) has been established with the U.S. Department of Commerce (DOC), National Oceanic and Atmospheric Administration (NOAA). Building on a commitment to increase research collaboration with MSIs, a collaborative program developed by NOAA and its MSI partners has led to a significant increase in the education and graduation of students from underrepresented communities in science, technology, engineering and mathematics (STEM) that support NOAA's mission. NOAA's Educational Partnership Program (EPP) with Minority Serving Institutions (MSI) was established in 2001 with a primary goal to increase individuals trained in STEM fields from which NOAA may select its future workforce. The program uses the National Science Foundation (NSF) data and internally developed performance metrics to illustrate a measurable impact on national statistics. To date, over 900 undergraduate and graduate students have benefited directly from educational and research experiences through the EPP and over 340 secondary (middle school and high school) students have participated in EPP activities designed to encourage students to pursue degrees in STEM fields. The EPP framework demonstrates that an effective partnership, with best practices, and concrete examples of success is available as a template for institutions and agencies working to replicate these successes. We describe our efforts at building programs in Earth and space science over the past decade at four Minority Institutions, Medgar Evers College, Norfolk State University, South Carolina State University and the University of Houston-Downtown. We present our institutional models of success and programmatic outcomes as well as barriers to success and lessons learned. The unique path to success for each school is described, along with experiences common among all four. Since these institutions do not offer graduate programs in the geosciences, they have concentrated on recruitment and retention of students in the K-16 pipeline while preparing them for graduate school and careers in the field. These schools represent a range in size, location, population served and in the type and nature of the Earth and space science programs they offer. As such, the experiences described herein offer a broad perspective on what does and does not work in attracting and retaining underrepresented minority students in the geosciences. This article offers a set of design principles distilled from the Building Engineering and Science Talent (BEST) examination of over 100 programs with documented success in recruiting and retaining minority students in sciences, technology, engineering and mathematics. By illustrating these principles in the context of the Significant Opportunities in Atmospheric Research and Science (SOARS) program, we provide examples for applying them in the realm of the geosciences. The SOARS Program combines multiple summer research experiences with intensive, multidimensional mentoring and a robust learning community to help undergraduate students complete college and make successful transitions into graduate school in the Atmospheric and related sciences. SOARS has been widely recognized through formal and informal assessments as a highly successful program. The Rural Alaska Honors Institute (RAHI) is an intensive, six-week residential high school-to-college bridging program aimed at preparing talented rural Alaska youth for the social and academic challenges of college. Since its inception in 1983, RAHI has demonstrated that it is an effective means of encouraging Alaska Native students to attend college and finish a post-secondary degree. Since 2003, a four credit, college-level, field-intensive, introductory geoscience course has been part of the RAHI curriculum. While it is difficult to evaluate what effect this specific course is having on the long term goal of recruiting more minority geoscientists, short term indicators suggest that the course is very effective in increasing the visibility of geology as a desirable career option amongst college-bound Alaska Native youth. The MS PHD'S Program facilitates the involvement of minority undergraduate and graduate Earth system science students in a series of activities designed to: (1) increase exposure to and engagement in the Earth system science community, via participation in scientific conferences, mentoring relationships, virtual activities, and field trips; (2) enhance professional skills, grantsmanship, oral and written communication; (3) provide funding, education and career opportunity resources; (4) facilitate networking opportunities with established researchers and educators; (5) and sustain on-going interaction, communication and support via membership within a virtual community comprised of peers, junior/senior-level researchers, and educators actively involved in facilitating full participation of minorities in the Earth system sciences. These activities, conducted in three phases, occur during professional society meetings, field trips, and a 'capstone' event at the National Academies. At the conclusion of the five-year MS PHD'S in Earth System Science Initiative's Professional Development Program, it is anticipated that a minimum of 100 Earth system science undergraduate, graduate and recent minority graduates will be better prepared to achieve their academic and professional goals. It is also expected that because of mentor-mentee partnerships, science exposure, and networking activities, MS PHD'S participants will remain actively engaged in their fields of specialization and respective professional societies. The NASA and NSF-funded Minorities Striving and Pursuing Higher Degrees of Success in Earth System Science - Professional Development Program (MS PHD'S PDP) initiative provides professional development and mentoring experiences that facilitate the advancement of persons of color committed to achieving outstanding Earth system science (ESS) careers. The three MS PHD'S PDP phases are connected by virtual community-building activities that occur through asynchronous/synchronous web-based dialogues. The purpose of this case study is to investigate virtual team building methods as tools for engaging and developing sustainable communities of students of color in ESS. Historically Black Colleges and Universities (HBCUs) attract, retain and award science degrees to African Americans at a higher rate than majority institutions. Because they offer life-changing and career-orienting experiences for students, field stations and marine laboratories are well positioned to help increase the number of students opting for science, technology, engineering and mathematics (STEM) careers and ocean science and education careers, in particular. Two kinds of partnerships have developed between Savannah State University (SSU), an HBCU, and marine laboratories as a result of federal funding: a Research Experiences for Undergraduates (REU) program between SSU and the Harbor Branch Oceanographic Institution, and an internship/graduate program between SSU and the Skidaway Institute of Oceanography. These collaborations and other funded projects since 1998 have resulted in an increase in the percent of graduates from SSU's Bachelor of Science in Marine Science degree who had a significant research experience from 25% before 1999 to 66% percent afterwards and an increase in the number graduating with honors from 30% prior to 1999 to 41% after 1999. The growth and productivity of marine science degree and research experience programs at Savannah State University illustrates how collaboration and partnerships can be an effective way to increase access and eventually pay big dividends by increasing diversity in geoscience professions. There is a great need to recruit and train students in fish population dynamics/stock assessment to meet the staff needs of state agencies, universities, National Oceanic and Atmospheric Administration/National Marine Fisheries Service (NOAA/NMFS), and international aid agencies in order to more effectively manage our fisheries resources. The need prompted the U.S. National Research Council to convene a workshop in 2000 to discuss ways of increasing the number of fisheries stock assessment specialists in the United States. In 2001, NOAA and Jackson State University (JSU), a historically black institution, established a three-year summer program consisting of a four-week course at JSU and a four to eight-week internship at NOAA/NMFS laboratories. The program, the first of its kind in the United States, was funded by NOAA Educational Partnership Program. Students majoring in biology, mathematics, computer science, or related fields from various institutions were recruited and exposed to fisheries science, particularly fish stock assessment. Forty-one students from 18 institutions and NOAA National Marine Fisheries Service Pascagoula Laboratory participated in the short course; 23 of the students were undergraduates. Eighteen of the students interned at NOAA laboratories after taking the short course. Seven of the participants are currently in graduate programs in fisheries science/applied mathematics, four of whom belong to underrepresented groups. The program was subsequently expanded, and funds were secured from the National Science Foundation to conduct an interdisciplinary training of students in biological and mathematical sciences with emphasis on fisheries stock assessment. A model deployed at Savannah State University (SSU) for enhancing diversity in the geosciences provides much needed African-American role models in the sciences for school aged children in the surrounding community. The most common and effective means of getting children excited about nature and science is to immerse them in the natural environment. Our aim is to inspire more young Americans to continue in the geosciences by increasing the number of African Americans teaching in informal educational centers and increasing the number of trained geoscientists teaching in the schools. This program model depends on strong partnership between a university and science educators from formal and informal education settings. In two iterations, this program trained 19 science majors from a historically black university in natural history interpretation and provided outdoor marine science camp experiences to children of a barrier island community. It also provided classroom teaching experience to more than 30 marine science majors who delivered geoscience lessons to nearly 300 school children in one academic year. Twelve percent more marine science graduates have pursued teaching positions in the past two years compared to our long term average. The University of New Orleans (UNO), Department of Earth and Environmental Science has been successfully recruiting minority geoscience students since 1974. The basis for that program is a field trip for high school students supplemented with scholarships and mentoring for those students who subsequently choose to attend UNO as geoscience majors. We have developed a program model that we believe may be exported either by components or in its entirely for recruiting racially and ethnically diverse high school students into the geosciences. Our long-standing professional development center at San Jose State University (SJSU) has recently focused its efforts on increasing the number of undergraduate students from underrepresented groups in university geoscience major programs. We collaborated with nearby schools and organizations that encourage underrepresented students to pursue scientific careers. We targeted middle-school, high-school, and lower-division college students, and middle-school and high-school teachers. Program components include summer workshops, one-day field trips and workshops, classroom visits by current geoscience majors and grad students, a "Geologist-in-Residence" program that pairs a SJSU geology student with a local teacher, student research internships, and scholarships to attract and retain SJSU Geology majors. As the project progresses, we have found that some components work very well but others need to be revamped or abandoned. While long-term impacts of this program cannot yet be assessed, the robust alliance of SJSU and National Hispanic University (NHU) has blossomed far beyond our original plans. NHU's charter high school engages students in the geosciences via field and classroom activities, and a new joint NHU-SJSU geoscience degree program offers students a clearly marked path to advanced studies and careers in the geosciences. This paper provides detailed ideas on how to set up a GIS program and how to develop it for maximum benefits in the areas of education, research and community outreach. We draw our experience from setting up the GIS program at Oglala Lakota College (OLC), Pine Ridge Reservation in South Dakota. GIS can be useful in many fields and is inexpensive to set up. Native Americans applied science in the past and now embrace GIS technology for everyday decision making. This article presents the wide range of GIS applications using OLC's GIS program as an example. We present our educational activities, research and community outreach. An example is the "Lakota Land" project in which we mapped historical sites and businesses and then published an interactive map through the internet. This report is presented to give detailed advice on how to set up a successful GIS program and to promote geospatial technology to other tribal or non-tribal colleges and universities. Startling national statistics continue to illuminate the need for increasing the number of underrepresented minority students graduating with degrees in the geosciences. With increasing minority populations in the U.S., diversity becomes a key issue for the sustained success of college geoscience departments. The under-funded Buffalo Public School system struggles to provide quality science education to underrepresented students, which leads to few minorities pursuing STEM (Science, Technology, Engineering and Math) degrees in local colleges and universities. The Buffalo Geosciences Program (BGP) was created to provide opportunities for these underrepresented groups to participate in geoscience activities in Western New York. Our current program model (through many modifications) has now resulted in success of this objective by offering science education and outreach programming to a broad variety of public institutions at the primary, secondary, and postsecondary grade levels. During these interactions, students are made aware of geoscience career options and encouraged to pursue internships through the BGP. The ultimate (and attained) goal has been to produce minority geoscience undergraduate majors in colleges and universities. The Earth Core program provided a one week earth science content workshop to urban public school sixth grade teachers who lacked geoscience training with the goal of increasing participants' pedagogical content knowledge (PCK) and confidence in teaching earth science. The workshop evolved from a concern that teachers would not have the training or experience required to engage students with earth science material due to new state standards switching geoscience instruction from 8th to 6th grade. 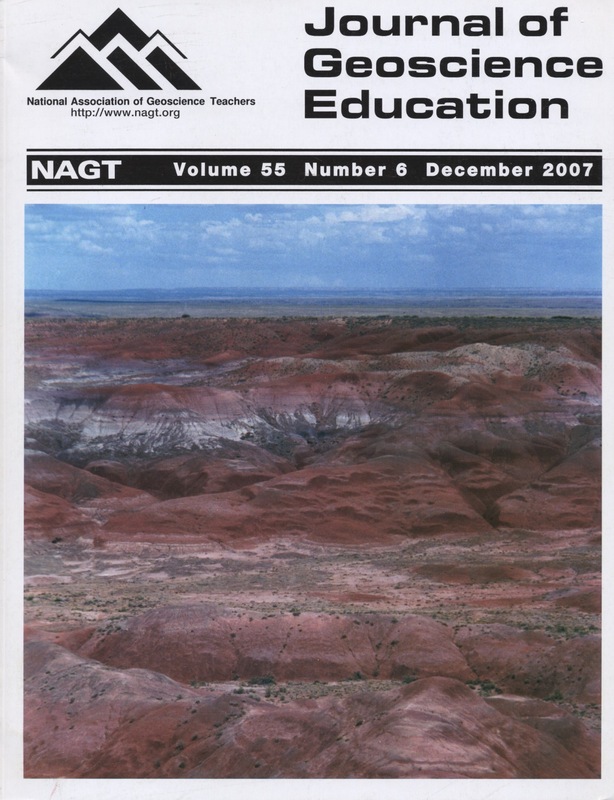 The program, aligned to Cochran's (1992) five suggestions for enhancing teachers' PCK, was designed to encourage participants to reflect by sharing teaching ideas, discuss what we found to be often naive earth science conceptions, share lesson plan ideas, and conduct action research. Field trips facilitated a bonding experience that encouraged collaboration by participants, and interactive lesson activities helped participants recognize their limited knowledge of earth science. Both qualitative and quantitative data collection methods were used in a mixed methods approach to this study. Participant confidence in teaching earth science was slightly elevated after the workshop. The study suggested that teachers realized how little earth science understanding they have after being confronted with advanced level geoscience concepts. Summer programs are a common strategy for increasing interest in STEM (Science, Technology, Engineering, and Math) careers among K-12 students. Here we report four years of results from a two-week program designed to expose Hispanic-American high school students in El Paso, Texas to content and careers in the geosciences. The goal of the program was to grow interest in geoscience among a group of students already interested in STEM careers in order to spur a long-term increase in the number of students entering the geosciences from a demographic group that is now greatly under- represented in the geoscience workforce. Short-term indicators, in the form of data from pre- and post-participation surveys, show statistically significant positive changes in participants' attitudes towards geoscience. Longer-term indicators, in the form of survey results designed to track participants' college careers, show that 55% are still in the geoscience pipeline, as measured by a choice of a STEM discipline as a college major and 10% are geology majors. This high retention rate compares very favorably with national data that show that in 2001, 32% of all bachelor's degrees were awarded in science and engineering disciplines of which 1% were in geosciences.